Spring is upon us and it's about time for the guilty mixes to come in again. 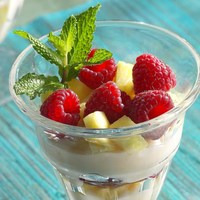 This mix blends perfectly with the fruit and light cream ratio. I wanted to make it very simple. TPA STRAWBERRY RIPE gives it that true fruit feel. Almost that natural ripeness. TPA APRICOT & PINEAPPLE is what you really taste here. Together they almost give it a tart sweetness. TPA RASPBERRY SWEET gives it sweetness that's add to the other flavors without destroying coils. TFA VBIC blends it all together. It really doesn't serve as a cream just helps glue the fruit together. Add koolada if you'd like for some coolness. This recipe is the property of Tkiese92 and released under the CC Attribution-Noncommercial 4.0 license. You may not copy, derive or commercialize this recipe without following the terms of this license or the explicit permission of the creator. This has been in my ADV rotation since it was shared. The only thing I've changed is that recently I've started adding a touch of INW Cactus to bring the apricot down and smooth it out a little. Wow this is a smooth and tasty fruit salad. This will be part of my rotation. Thanks for sharing!